Ripped Recipes - Pumpkin Carrot Cupcakes! 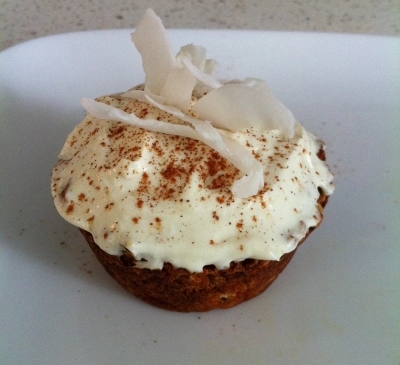 Home » Recipes » Dessert » Pumpkin Carrot Cupcakes! Grease a muffin tin, (you can make 12-15 cupcakes) and press batter in about 3/4 full. Bake at 350 for 25 minutes or until golden and toothpick comes out clean. Remove from oven let cool 15 minutes then transfer to a cooling rack. I Mixed together light cream cheese, greek yogurt, stevia and vanilla protein powder, sprinkled with cinnamon and coconut shreds.